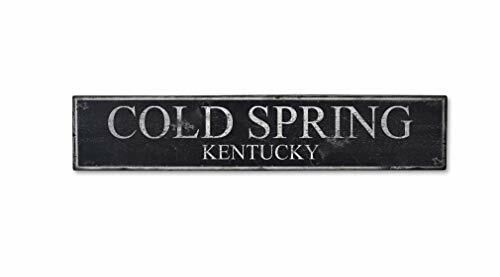 Cold Spring, Kentucky - Vintage Personalized City and State Wood Sign, Rustic Wooden Sign ENS1000706!! 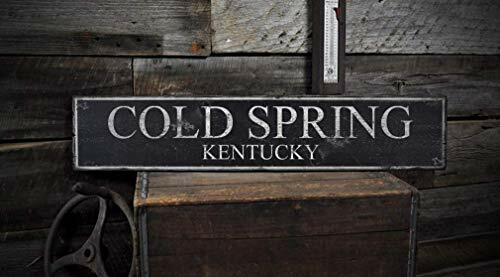 This hand-made sign is skillfully made in our small shop in Lizton, Indiana USA. All signs are brand new but go through a unique 10-step process to add a distressed look, giving the sign a weathered and vintage look. This sign is made of 3/4in. thick knotty pine, and is 100% American made! Looking for a custom sign? Please contact us for a special concept just for you. We also offer a large variety of colors as well so if you would like this sign in another color combination please just let us know. The best way to do this is for you to browse through our signs that we have made and then let us know the colors you like on them. Most of our signs are designed to change a particular line or two of text, so you can personalize it to your family name, business or your favorite destination, be it your home town, or the beach you travel to etc. Any significant changes in design will need to be quoted but text and colors can be changed. ****The Largest size (11.25"x60") ships in the USA only! Here at the Lizton Sign Shop, we have been making signs since 2003 and have sold to over 190 countries. 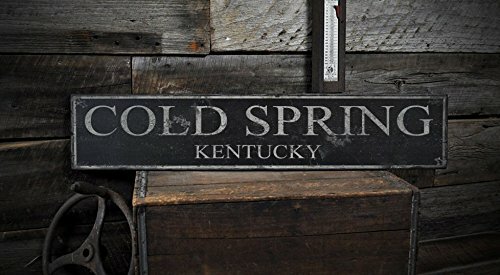 Our signs are perfect for lake houses, beach houses, cabins and lodges, rustic settings, barns, farms, your mancave, primitive decor, beach decor, den, office, basement, garage, hunting retreat, retail shop, restaurant, cottage, condo... well we can make you one for just about any location you can think of. ****Colors may vary slightly from one computer screen to the next but the image should be very close. Regarding colors, please keep in mind the colors you see on the screen are very close to what you should expect, but if you have questions please ask. All designs are originals by The Lizton Sign Shop. All content and designs are subject to copyright and may not be reproduced in any form. Looking for a custom sign? Please contact us for a special concept just for you. Made of 3/4in. thick knotty pine. Hand-crafted in the USA! Comes in 4 different sizes! All signs are brand new but go through a unique 10-step process to make them look like they've been around for hundreds of years! Our signs truly make a one of a kind gift.